For sports fans in Seattle, it’s been a dry year . . . er, decade. Sounders FC? Maybe, but holding your breath is hazardous to your health. If you’re a real sports lover, however, you’re still feeling the high from the stupendous display of athleticism, sportsmanship, and teamwork put on by the women of the Seattle Storm, who swept through the WNBA playoffs without losing a game. For that matter, they never lost a game at home this season. Now THAT’S sports at its best. Compare that to the owners of the various men’s pro teams. Sure, Paul Allen also stepped forward to keep the team in town, but neither he nor the others seem to have the passion for sports that makes them vibrate with enthusiasm and commitment, the way you can see the Storm owners do during games. Somehow you get the feeling the baseball and football owners (and not just in Seattle) revel in the ‘being the VIP’ status, and there’s no question the long-term financial benefits are significant. Okay, props to Drew Carey and the Sounders FC ownership: they too love the game and appreciate the fans. 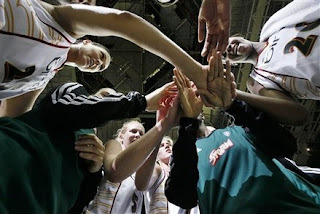 Then there’s the thoughtful team-building, permitting CEO Karen Bryant and Coach Brian Agler to take their time bringing together the players to complement Lauren Jackson and Sue Bird --- and thereby also emerge as stellar players in their own rights. This is playing for keeps, and not racing around after this year’s brass ring. Why does this matter? Well, four days after the Storm took the championship, some of us celebrated the anniversary of Billie Jean King’s defeat of Bobby Riggs, which some view as a catalyzing event for women in sports and just as important, for the credibility of women’s sports. Billie Jean showed the world that women athletes are just that: athletes. Not girls in skirts, not dilettantes marking time until tea and crumpets are served, but strong, committed, talented athletes. Compare the hoopla and the large serving of condescension surrounding the King-Riggs match with the respect, admiration and downright awe Jackson, Bird, Cash and the others receive and deserve. It makes those of us who played sports long ago (track and field, if you must know) and those of us who didn’t but longed to, or who felt we would be despised (and were often right), or who enjoy being fans without playing, smile and be thankful for the role models --- on and off the court --- that these amazing young women are for our community and our country. And for all of us at Legal Voice, where our very first case was about equity in athletics, it rings a bell of vindication and celebration. Go Storm!